The TM-T88V is the latest addition to Epson�s industry-leading TM-T88 POS printer series. Designed for use in food service and retail environments, the TM-T88V offers more speed, features and reliability than ever before. Now you can speed customer throughput with the TM-T88V printer. 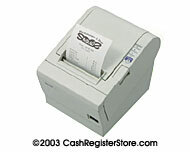 It prints both receipts and graphics at the same high speed of up to 300mm per second�50% faster than the TM-T88IV. And it�s the first printer in the industry to offer 16 levels of grayscale to ensure clear, crisp graphics. With a MCBF of 70 million lines, 35% higher than the TM-T88IV, and an autocutter life of 2 million cuts, the TM-T88V delivers best-in-class reliability so critical in high volume environments. The TM-T88V is packed with easy-to-use features including drop-in paper loading, an autocutter, easy-to-read LEDs and an improved cover design to protect the printer from foreign objects.